The Business Priorities for 2013–2014 is the statement of our goals for the year ahead. The cornerstone of our business is to keep the community safe, with a focus on Public Safety, Crime, Traffic Policing and Emergency Management. Our commitment to these Output Groups will this year be reinforced by the Support to the Frontline Strategy. In challenging financial times, the Support to the Frontline Strategy embraces technology, and our most valuable resource, people; to continue to deliver an effective and efficient police service. The Action Plans of each geographical and support command will detail the delivery of services and business outcomes that collaboratively work towards the achievement of the Departmental priorities for the year ahead. Guiding Principles have been developed to help shape our thinking and behaviours to assist in achieving organisational goals. The adoption of these principles will enhance DPEM’s reputation as a progressive, inclusive organisation that strives for success. To meet DPEM’s Vision of ‘a safe, secure and resilient Tasmania’ the Department will focus on the Values of Integrity, Equity and Accountability, as these provide a sound foundation for the types of ethical behaviour expected from our people. This behaviour will be demonstrated in every aspect of our work, including when we deliver services to the community, and when interacting with each other. Goal 4: A fully integrated and interoperable environment that facilitates a seamless acquisition and provision of, information through innovative and/or technological systems and reforms. Goal 5: A scalable and flexible organisation, capable of forecasting opportunities and threats, while meeting the challenges of responding to changing financial, social, and political environments. Output Group 4: Emergency Management. The operational delivery of the services that are included within each Output Group are reflected in the Geographical Command Action Plans and the delivery of business outcomes in the areas of People, Innovation and Business are reflected in the Department’s Support Command Action Plans. 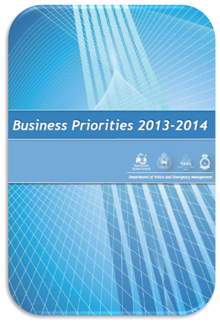 View the: DPEM Business Priorities 2013-2014. This page -- https://www.police.tas.gov.au/historical-corporate-documents/business-priorities-2013-2014/ -- was last published on July 11, 2018 by the Department of Police, Fire and Emergency Management.